There are a lot of sites and software that allows the user to download videos from YouTube, as well as a lot of sites that allow you to download video clips from Anstagram, or Kiak, or Facebook. 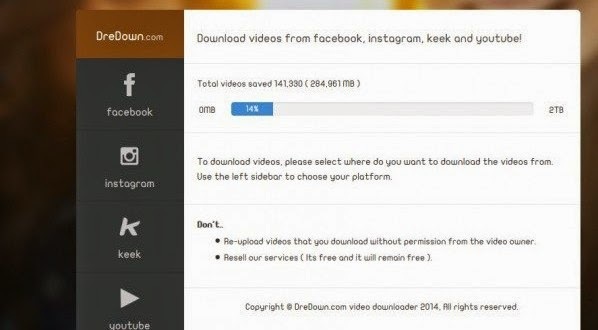 But dredown.com site combines most of these options in one place, it allows the user to download videos from YouTube, Anstagram, Facebook, Kiak, all easily and once you put the video link in its place. The site allows the side in his list several options for each network intended download video clips of them, and only on the user's selection of the desired location download video of it, and then put pressure on the link and Dredown to the site simply by providing download links.